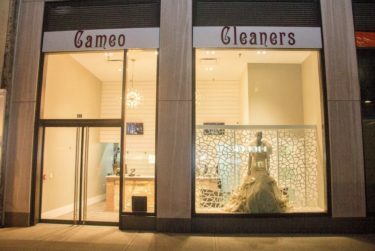 As some of the best dry cleaning, NYC residents can experience luxurious, professional hand cleaning services at Cameo Cleaners. When it comes to hand cleaning clothes, Cameo defines quality dry cleaners. No matter how tough of a stain or blotch, our team can restore all of your garments that are too important and delicate to be processed by a machine. Our restorationists always hand wash delicates. Fine dry cleaning and hand cleaning is a way of life at Cameo Cleaners. We pride ourselves on cleaning fragile garments too delicate to be processed by a machine. Our technicians carefully treat these items using our 100% organic dry cleaning method. We can handle fine clothing that local cleaners wouldn’t dare handle. We remove everything from deep-set stains to little spots from day-to-day accidents. Don’t trust your most treasured pieces of clothing to the hands of amateurs. Cameo Cleaners is here to keep your wardrobe looking like new. As one of the top dry cleaners NYC has to offer, we’ll even deliver your garment to your doorstep, or ship anywhere in the world! Call today to schedule your cleaning and discover why we’re the best dry cleaners in Manhattan. ” I just had two very special garments that had “food accident” stains completely transformed by Cameo Cleaners. I am so impressed with the quality and care that was given, I have made Cameo Cleaners my one and only “go to” for quality care. And both garments had very difficult stains I had been previously told would not come out!! I couldn’t be more impressed and thrilled with the results. ” – Suzanne B.